Troubleshoot and validate high-speed designs now and into the future with upgradeable bandwidth that starts at 1 GHz and goes up to 8 GHz . Get accurate measurements with low noise and 25 GS/s sample rate per channel -- sample rate does not drop as you turn on channels. See signals you couldn't see before. Lowest input noise enabled by new TEK061 front-end ASICs. 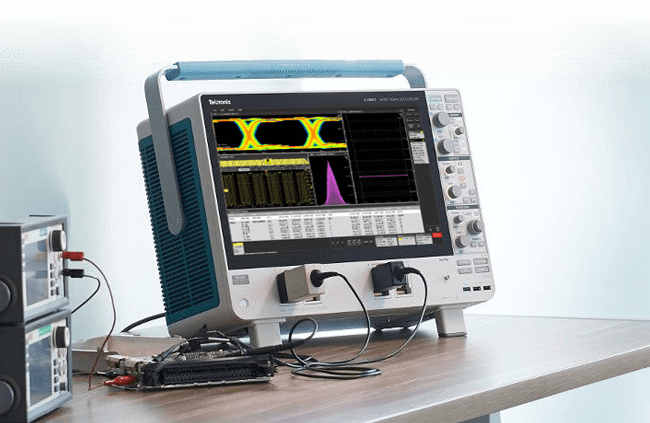 Characterize jitter on GHz clocks and serial buses with ease. Effortlessly bring statistics into your everyday toolkit with integrated advanced measurements. For example, use the same drag and drop action for jitter or advanced power analysis as routine rise time and rms measurements. Enter a world of versatility with four FlexChannel® inputs. Browse your circuits with included 1 GHz, 10x probes. Connect high performance single-ended active probes or differential probes, or do both at once with new TriMode probes. Expand your view by connecting a TLP058 probe to any input and get 8 digital channels - up to 32 digital channels.